Stitched Together: Adopted Kids are Born, Too! Adopted Kids are Born, Too! Well, of course we all know that adopted children are born. But did you know that, according to Adoptive Families magazine, it's common for adopted kids of preschool to early school age to not understand that they are born just like biological kids are? 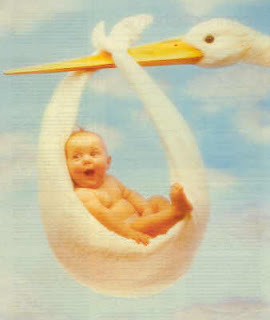 Many understood that they had a first mother and that they grew in her "tummy" but still didn't get that they were born. They felt they were different from biological kids in this way. To me, it isn't too surprising that young children, adopted or biological, may be confused about how they entered the world. Up until the last 50-80 years, birth was considered a normal process that most children witnessed firsthand. Babies were born primarily at home. Many children grew up on farms where they observed their farm animals giving birth. Contrast that to today where 99% of births occur in hospitals or birth centers. Mom comes home with a new baby in arms and the other child(ren) in the family may or may not know exactly how the baby got there. Very few of us live on farms these days. Those of us with pets generally have them spayed or neutered. I want my children to see birth as a normal process. I want them to know that birth is not something we need to fear. Yes, it is painful, but women are strong. As I often remind pregnant women - their bodies know how to give birth. We talk about birth. We retell their birth stories on their birthdays each year, sometimes more often if they ask. On Evie's birthday, we talked about how she was most likely born at home, according to the Ethiopians we spoke with while traveling there. As a doula, they hear me talking about birth with my friends, doula sisters and occasionally clients. Indigo is particularly interested in birth and has seen YouTube appropriate birth videos. So you can imagine my surprise when I was brushing Indigo's hair this morning and she asked me, "Mommy, how did Evie get out of her first mommy's tummy?" "What do you mean? How do you think she came out?" I asked her, seriously. "Mommy, I just don't know," she replied honestly. My kids know that babies are born one of two ways, vaginally or by Cesarean section. She wasn't asking this. She was truly bewildered as to how Evie was born. Of course I explained to her (in the matter-of-fact language our family uses) that Evie was born just like every other baby is born. I could see she was still having a hard time wrapping her mind around it. This conversation with Indigo reinforced the point I had read in Adoptive Families. We need to talk with our adopted kids about being born and about what that means. We need to tell them that they were born just like everyone else. We can't just assume that they understand on their own. Has your adopted child ever asked you about their birth? Have you preemptively discussed it with them? I'll be curious to see how Evie reacts to this topic as she gets older and more verbal. I've recently read more about this as well!! Got a great book about creating life books and they really emphasized the page about telling them they are born just like everyone. Gave good examples and wording for young kids. Thanks for sharing this! That reminds me - I have two books of yours I need to get to you - Miss you! Would love to have you over soon now that summer is here! Very interesting, and something I wouldn't have thought of. Thanks for sharing this. I'll be more prepared now. Interesting! I read that AF article recently, and M's godparents just had a baby, so I'm taking the opportunity to try to explain things to him. With a 2-year-old, this is daunting!